Paisley’s annual cultural extravaganza, The Spree, got underway today… helped by National Theatre of Scotland offering a truckload of chances to see the area as never before. The seventh year of the Spree (12 to 21 Oct) will see 87 shows in 17 venues in five towns around Renfrewshire over ten days – with music, comedy, theatre and much more. The iconic Spiegeltent in County Square will host musical acts The Orb(Mon 15th), Tracyanne and Danny and The Pastels (Sat 13th), ex-Kraftwerk man Wolfgang Flur (Sat 13th), The Wandering Hearts (Sun 14th), Vieux Farka Toure (Tues 16th), The Leisure Society and Duke Special (Weds 17th), Big Minds (Thurs 18th), and Gang of Four (Fri 19th). 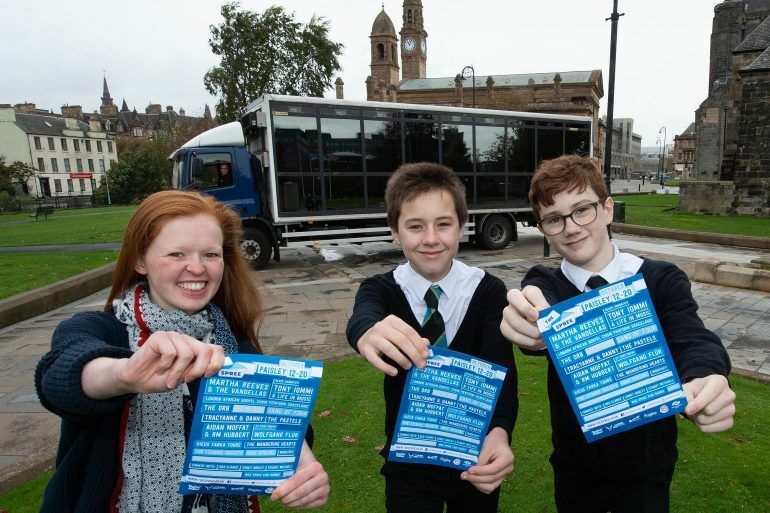 The show is presented by award-winning German documentary theatre specialists Rimini Protokoll and is part of NTS’s Futureproof festival, marking Scotland’s Year of Young People 2018, and some of the young cast were on hand to help launch the festival outside Paisley Town Hall. Other Spree highlights over the next 10 days include a sold-out comedy show with Des Clarke and Janey Godley (Spiegeltent Fri 12th), Aidan Moffat and RM Hubbert (Paisley Arts Centre, Sat 20th), the ModStufffestival-within-a-festival (Spiegeltent, Sat 20th) plus a visit from The National Whiskey Festival (Paisley Town Hall, Sat 13th).